The drummer is one of the most important, if not the most important participant in a band. As a drummer, you are the backbone of the band and other musicians heavily rely on you. Being a drummer is all about keeping the right rhythm. Apart from being very important part in a band playing the drums gives you the ability to truly express yourself. 3.7 Electronic drums are no joke! Playing drums is a very common and efficient way to express yourself through music. The heavy bass and loud crash will help you in creating the sound you want to hear. When you practice playing the drums on a frequent basis you are able to develop amazing skills that will allow you to create amazing beats and sounds. The beautiful thing about music is that you can share it, you can use it to impress and inspire people. If you see people moving to the sound and rhythm you have created you can be sure that you’re doing a good job. But if you’d rather keep it to yourself you will find some great things about electronic drums below. However, playing the drums is more than expressing yourself! Drumming will improve physical well-being, mental well-being. It may even help you get your arms stronger and lose belly fat. Moreover, it helps you connect with people, connecting is one of the most beautiful effects of music and playing the drums. While you play the drums you are continually improving your physical well being. 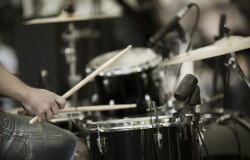 In fact, studies show that playing the drums in a fairly consistent manner allows you to burn 250 calories an hour. Apart from burning calories you are actually building muscles at the same time. You are using your whole body and almost every muscle group while banging on your drum kit. While you are playing the drums you do not only develop your physical well being but you are developing your mental well-being as well. Research shows that drumming and playing music increases the development of multiple regions in the brain. It improves listening skills and it increases the ability to focus over an extended period of time. Doing so will improve your coordination and encourage kinesthetic development. As mentioned earlier playing the drums allows you to express yourself. While you are expressing yourself other people are able to hear the sound you are creating, they like it or they don’t. We can assure you, whatever will you be playing, there will always people with the same taste in music as you have. These people are the ones who will come to you after a gig and say:”Hey! 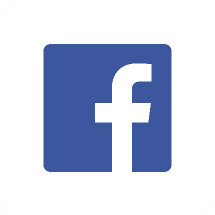 That was great!” Eventually, these are the people can “connect” with, meaning that it will be fairly easy for you to communicate, socialize and interact with them. Maybe even make music together. Playing the drums is good for your physical well-being as it will help you burn calories and build muscle, it’s good for your mental well-being as it will improve coordination and encourage kinesthetic development and it allows you to connect with people. These are all great benefits of playing the drums. However playing the electronic drums allows you to explore an even wider spectrum of benefits. Playing drums is a good way to improve yourself mentally and physically, also it allows you to express yourself and it’s fun at the same time. However, as a drummer you are probably used to noise complaints. In fact, most drummers get noise complaints on a daily basis. Starting from their family members and ending with the neighbours (or even the cops). This is exactly the reason why electric drum kits are awesome. Whichever musical style you like the most, you can select the right kit for it with a click of a button. Electronic drum kits give you the opportunity to change the sound of your kit whenever you want. There are all sorts of different kits built into one computer like arena rock kits, funk kits, hip hop kits, jazz kits, even techno kits and many more. One of the main reasons people choose an electric drum kit over an acoustic drum kit is the fact that the electric drum kit does not make much noise. The hit of a pad on an electronic drum kit generates little to no acoustic sound. A hit on an acoustic drum kit can generate extremely loud volume levels. An electronic drum kit is a great choice if you wish to live in harmony with your neighbours or in any other situation where volume may be a problem. Most of the electronic drum kits available on the market have a set of very useful build-in tools. One of the most useful is the built in metronome function with adjustable tempo. A mix-in jack is used to play your favourite drum along tracks straight of your mp3 or CD player. Some even include a tool that works as a drum-tutor that helps the player in improving his drumming skills with a broad variety of exercises available by a touch of a button. Some of the more expensive electronic drum kits even have built in record and playback features. This makes it super easy to participate in the recording process. MIDI is the standard for connecting your electronic music devices to computers and software. A lot of electronic drum kits have a MIDI feature built in. This makes an electronic drum kit easy to use for producers and other professionals of the musical industry. Electronic drum kits are very durable, they’re made out of materials that are hard to break like light-weight aluminium and rubber or mesh. Not only your kit will last way longer but also your drumsticks. They won’t get so damaged and there will be a smaller chance for them to break while playing an electronic drum kit. There is of course a possibility that something breaks, however replacing a part on an electronic drum kit is easier than on an acoustic drum kit. Electric drum kits are relatively cheap compared to acoustic drum kits, the cheapest electric drum kit on the market is about the price of a new bicycle. A basic electric drum kit is equipped with a hi-hat, 3 toms, a snare, crash, cymbal and a bass. Like every drum kit the electric drum kit comes with a frame, however the frames of electric drum kits are usually made out of light material. This makes the entire set easy to transport. Roland is one of the leading brands in this market. One of their most beautiful sets is the Roland TD-15K. The set is exactly what you would expect from a high quality drum kit. The Roland TD-15K is one of the most expensive drum kits on the market. Another beautiful electric drum kit is the Pearl E-Pro Live Drum Kit. This electric drum kit looks just like an acoustic drum kit and gives you the feeling as if you are actually playing on an acoustic drum kit. The Pearl E-Pro Live Drum Kit has a high price compared to other drum kits but it is worth your money. For those who are looking for cheaper alternatives, an electric drum kit is the right choice. Remember that the more you pay the more you get. The expensive electric drums are different from the cheap ones mostly only with their drum computers, so a cheaper version will only have less style and options in it but it will still be very professional and playable. 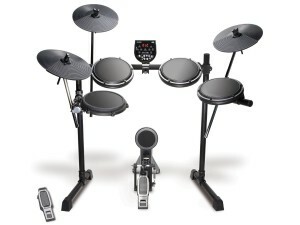 The material used of wchice the electronic drum kit is made depends on the price of the drum kit and the manufacturer. Rubber Pads are usually provided with the lower-end electronic drum kits. They’re made of rubber and they are relatively cheap. Mesh Heads are provided with the higher-end electronic drum kits, however the snare-drum on any electronic drum kit is usually a Mesh Head. Mesh Heads are the closest thing to a traditional drumhead. They feel similar and give similar rebound. The Mesh Heads are adjustable which makes them very user friendly. The price of a Mesh Head is a bit higher than the price of Rubber Pads but that’s very reasonable. The quality of the sound you produce on your drum kit is very important, the drum computers on the electric drum kits are usually capable of producing magnificent sound. The mistake people often make is to use cheap/low-end headphones, and sometimes even in-ear headphones. 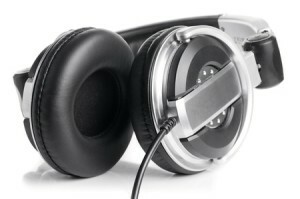 It is advisable to get a pair of headphones that can produce the quality of the sound produced by the drum computer. Roland and Yamaha offer a couple of headphones specially designed for electric drum kits. However any high-end pair of headphones will most likely do the job. Whenever your neighbours are not at home, you can plug in the amplifier and make some noise in your basement or attic. Wherever you are if you have an electric drum kit and you want to produce some sound you are in desperate need of a drum-amplifier. When electric drum kits first entered the market it was very hard to find an amplifier to produce just the right sound. Most of the amplifiers out there were specially tuned to amplifying the sound of an electric guitar and not the sound of a heavy bass or a sharp crash. Over the years a lot of companies jumped in and created some of the most awesome electric drum-amplifiers you will ever come across. Roland has released a lot of amplifiers and even amplifiers with additional speakers to create the most beautiful sound you’ve ever heard. The price of drum-amplifiers range from affordable to crazy expensive. The better the amplifier the more enjoyable your electric drum kit will be. The music world has evolved a lot in the recent years. A lot of modern electronic equipment was introduced meant to complement the music industry. 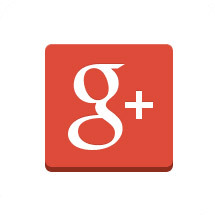 Nowadays a lot of music is generated by electronic musical instruments and in fully electronic environments. An electronic drum kit is a must have for every musician who is serious about producing a sound. The first electronic drum kit was created in 1971 by Graeme Edge, the drummer of The Moody Blues. He created the drum kit in collaboration with Brian Groves, who was a professor at Sussex University. The electronic drum kit was made out of rubber, silver paper and silver coils. 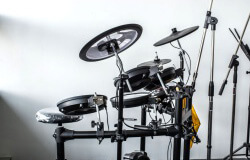 After the creation of the very first electronic drum kit, a company called Pollard Syndrum took the idea and developed it into the first commercial electronic drum kit. However the drum kit was a financial failure and ruined the company for the following years. In 1978 the Simmons company launched a successful electronic drum which was used by pop rock and synth pop bands such as Duran Duran. Then Roland and Yamaha stepped in and started to continually improve the electronic drum kits they had created over the years. In fact Roland and Yamaha are still the most successful companies in the electric drum market as of today. They released some of the most advanced and high quality electronic drum kits available. One of the many variations on the original electronic drum kit is the table-top electronic drum kit also known as the portable electronic drum kit. This drum kit has all its pads expect food pedals built into one module the size of a laptop. It has small built-in amplifiers and speakers. This instrument is very popular among electro/house DJ’s who have no room on their stage for a full electronic drum kit. Electronic drums are no joke! A lot of famous artists are or have been using drums for a long time. Since the 1970’s the electronic drum kit has evolved into a truly amazing instrument. Check out the list below for some famous artists who are fond of electronic drum kits. These are just some examples, there are many more artists who love electronic drums. In upcoming years, more artists will probably turn to electronic instruments. This is because electronic instruments are very friendly to use, and they keep upgrading every year. And with the rapid growth of the digital music scenes like techno and house the table-top electronic drum kit is likely to grow in popularity fast. For an example to see what a drummer can do on an electronic drum kit, take a look at the drummer of the band Netsky. The electronic drum kit has evolved into a very advanced musical instrument, it makes things much easier. It took some time to get here but now that the electronic drum kit has reached these heights, it’s unbeatable. The benefits of playing an electronic drum kit are tremendous. It’s good for you physical and mental well being. 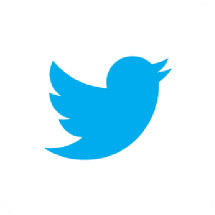 It allows you to connect, socialise and express yourself. Electronic drum kits are cheaper, and you get more bang for your bucks. They are very durable, user-friendly and come with a wide variety of tools which make practice more enjoyable. And the electronic drums are very popular a lot of famous artists have used them and are still using them, so should you! It’s not only the electronic drum kit that is amazing but you also get the ability to improve your drum experience by adding things like a good pair of headphones, a specially designed amplifier, new pads with either rubber or mesh heads. Some of the best drum kits and adds are manufactured by the famous company’s Roland and Yamaha, you are however not limited to them as there are new companies entering the musical market every year. Since the electronic drum kit is an electronic device there’s always the opportunity to improve the instrument. The drum-computers are more advanced every year and are surely to improve even more in the coming years. We know why electronic drum kits are a must have now and who knows what they will bring us in the future!